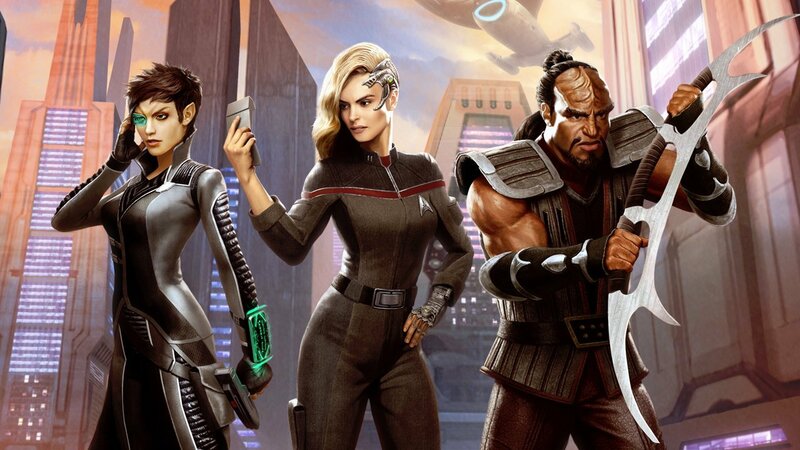 Unlike the opening paragraph of this review, I have to say I was actually surprised when I started up the console version of Star Trek Online. 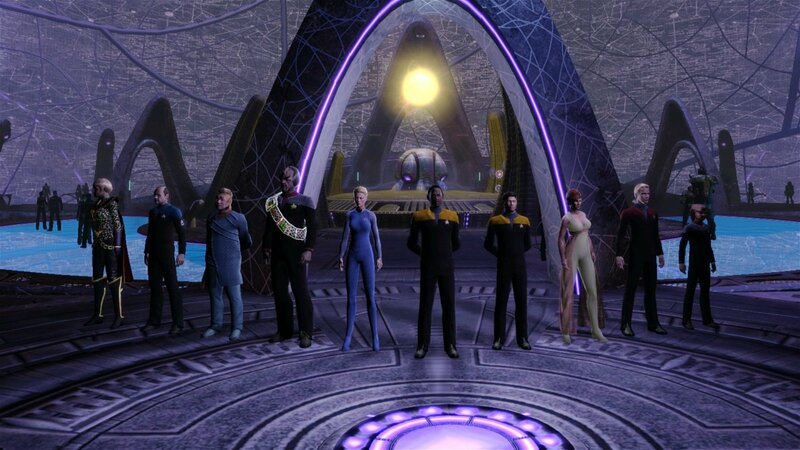 When I was captaining the USS Million Voices (an even deeper Gene Roddenberry’s Andromeda reference) in the PC version of this game, I found the whole thing rather boilerplate when compared to other MMORPGs. 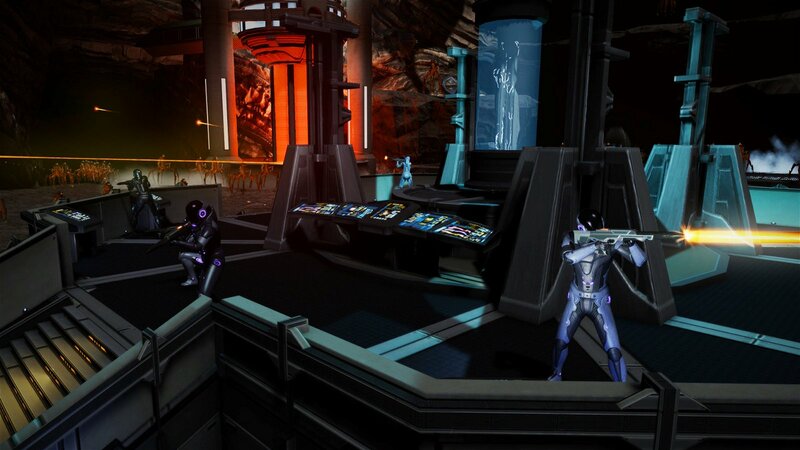 However, the console port of Star Trek Online offers players a new interface, tutorials, locations, and a good amount of voice acting throughout the game. The plot of the game hasn’t changed much with a Federation-Klingon war still acting as a backdrop for your rapid ascent to the captain’s chair. The reasons and method of your field promotion are a little better planned out now, but you still go from cadet to captain so fast that even Christopher Pine would try to drag you back a few feet. Regardless of that it is easy to notice that while we were all looking at Overwatch, Destiny and a few other games; the men and women of Cryptic Studios were doing a serious amount of overhauling. Unfortunately, once I got past the shiny new wax coating of Star Trek Online, I realized that some of the worst rust spots remained. When the game was launched on PCs about six years ago there was a round of applause for the depth that Cryptic Studios went to create a universe to play in, but like a 2-star amusement park there really wasn’t much to do in it. Six years later I was surprised to find that not much has changed when it comes to the gameplay of Star Trek Online. You could call it a lack of variety or a blind adherence to conventional MMO game-play. You could even say that the major problem with Star Trek Online is pacing. Whatever label you apply, one major issue still exists with this game. The underlying concept of Star Trek is a grand adventure where almost anything is possible. 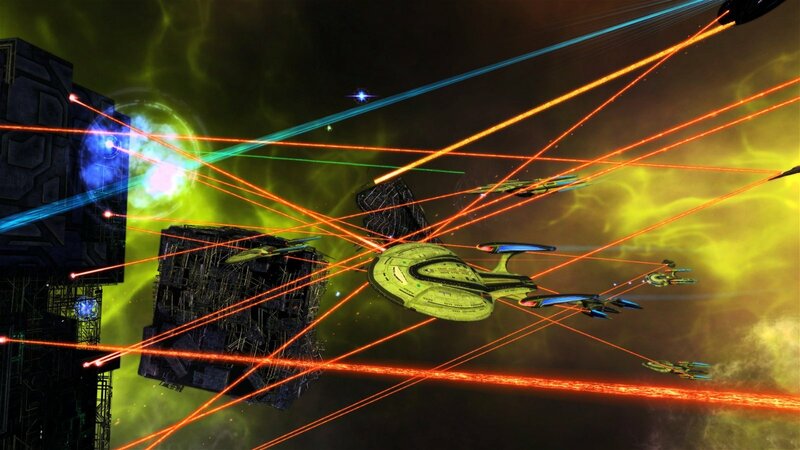 Star Trek Online on the other hand, is mostly about shooting things and that’s about it. You would think that captaining a spaceship would be exciting, but the majority of what you do is turn in circles while holding down the firing button. You don’t even have to worry about accuracy since the game will auto-lock on opponents. In terms of tactics, all you have to worry about is keeping any drained shields pointed away from whoever you are attacking. 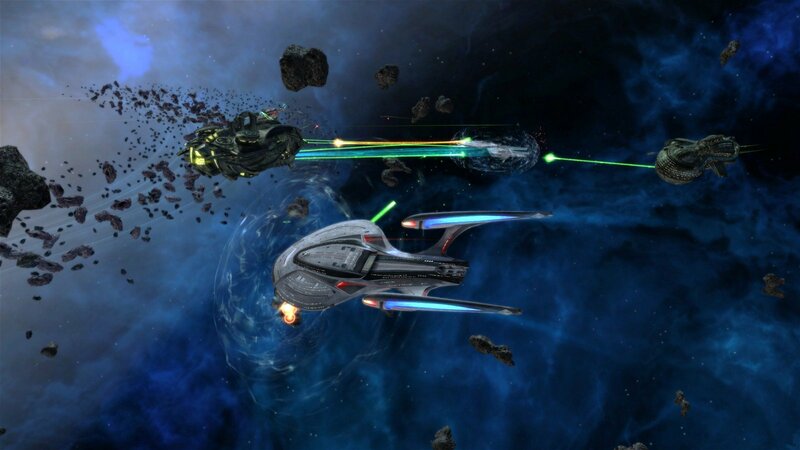 The fact that Star Trek Online is not that difficult also allows you to turn fights into simple slugging matches. If you role-play as a science officer or engineer you will have a few more tricks up your sleeve, but it is still not enough to make things engaging. Space combat is the majority of what you’ll do in this MMORPG, but on occasion you will also lead a group of your officers on various land based away missions; sadly, this part of the game is even less interesting. I will acknowledge that the missions are a lot more streamlined when compared to my time on the PC version Star Trek Online; however, missions still consist of walking up to things and pressing buttons. Sometimes those things are digital consoles and sometimes those things are enemy A.I., but you are still just pressing buttons and watching progress/health bars. To make matters worse, the auto-locking will often switch to friendly A.I. characters in the middle of a fight. That’s not impossible to work around, but it becomes very annoying since battles often become close range melees. Ground levels are also surprisingly small and often filled with invisible walls that pop up when you don’t expect them to. Eventually all these minor issues caused me to stop exploring, and instead I would just focus on finishing a mission so I could move on. After about ten hours of gameplay I traded in my starting vessel, a Miranda class ship I named the USS Kevin Sorbo, for a Constitution 2 class heavy cruiser (the same as the USS Enterprise-A in the movies) that I named the USS Toronto. I really wish I could tell you that this is when the game turned around, but the only change I noticed was that I was taking on more powerful opponents. anniversary of a franchise that has had thousands of creative people making thousands of movies, shows and books about trekking around the stars. The people at Cryptic Studios dipped into that material with a construction excavator to flush out their universe, and Gene Roddenberry would be proud of the virtual Alpha Quadrant that they built. The unfortunate part is that they don’t go to those depths in the mission design. Sure you’ll find yourself shooting at the ships of a small criminal organization that played a minor role in the television show Star Trek Deep Space Nine, but you’re still just spinning your ship around like you did against the Klingons, Borg and Romulans. There are a few more things I could call out as being disappointing, like the fact that there is nothing for you to do on the bridge of your ship; however, the rest of the game is actually pretty impressive. The control inputs are very accurate and every act is done through a streamlined menu system that is easy to navigate. The Star Trek references go so deep that even the biggest fans will have to google one or two things. The galaxy you can explore is massive, and far easier to navigate when compared to what the PC version was originally like. The game’s graphics are of a lower resolution due to the fact that it’s a MMO, but every ship, station, and object has an impressive amount of detail. The character creator is almost a game by itself because of all of the choices you can make. The missions you play in this MMORPG are even called episodes and each episode starts with same visual treatment as the television shows. USS Enterprise the franchise is still boldly going where no man has gone before. Unfortunately this MMORPG has decided to play it a lot safer and as a result words like easy and boring can be attached to it. After playing the game twice in the last few years I am impressed by how Cryptic Studios have improved, added and streamlined things; unfortunately, Star Trek Online requires better mission designs to make it interesting. The only reason I would suggest it at all is because it is free-to-play these days, but make sure you have some interest in Star Trek before downloading it. If it wasn’t free I would suggest you use your money to get some of those limited edition stamps that the post office is selling instead. If Star Trek Online wasn’t free it would be as fun as collecting those anniversary stamps, but it more expensive.